Check into one of these beautiful places in Maine for a romantic weekend vacation filled with great scenery, gourmet dining and a choice of things to do. Some of the resorts and inns that made our list offer spa services and their own restaurants while others are near day spas, boutique shops and art galleries. Explore beautiful lighthouses, Portland, Bar Harbor and other great Maine vacation destinations. 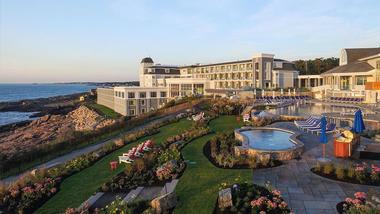 At the luxury Samoset Resort, couples can have it all: incredible scenery, elegant accommodations and a choice of dining options. For the ultimate privacy on your romantic getaway, book one of the luxurious cottages with views of Penobscot Bay and the golf course. Each cottage has a fully-equipped kitchen, two gas fireplaces and flat screen TVs. If you are looking for Maine getaways with a view, at this unique resort you can wake up with a view of the ocean right from your bed. Floor-to-ceiling windows let you enjoy the natural scenery from every angle in the romantic cottage. Ask about spa packages when booking your stay. Browse more Maine vacations. Sebasco Harbor Resort is what you would expect from a luxury Maine resort: an oasis of tranquility, elegant and beautifully designed, sprawled on 550 acres of rugged coast, surrounded by towering pines with spectacular views of the ocean and the quaint harbor. You can stay in the romantic 1945 lighthouse with wonderful views of the endless expanse of sea, in the main lodge, with its cozy, comfortable rooms with ocean breezes and typical Maine wrap-around porch, or in one of the luxury Harbor Village suites, with beautiful maritime décor, air-conditioning and all other modern amenities. Enjoy authentic Pure Maine culinary experience at the Pilot House or the Ledge Pub with its lovely ocean view patio. Let yourself be pampered at the Fairwinds Spa, spend a day golfing, take a mountain bike ride, a vigorous hike or a kayak trip, or sit in the garden with a book and enjoy the pure Maine beauty. Couples enjoy stunning views of the Moosehead Lake, relaxing massages, romantic rooms with fireplaces and hearty Maine cuisine at The Lodge at Moosehead Lake. Spa treatments are offered in the privacy of your room and in the luxury Mt. Kineo Suite with panoramic views of the lake. Choose from a number of fun activities, from unique Safari Camp Dinners in the summer to wildlife tours and float plane rides. Rooms at The Lodge at Moosehead Lake start at $250 per night. Located right on the edge of one of Maine’s most beautiful bays, the Grand Harbor Inn is a stylish and luxurious boutique-style hotel offering all the exclusive little extras to make your stay special. Ten exclusive rooms and suites have been carefully furnished and decorated to provide old-world charm without sacrificing any modern conveniences. All the rooms feature king-size beds, spacious bathrooms with Jacuzzi Tubs and separate showers, fine linens, and a distinctive New England ambiance. For a very special treat, request one of the Grand Waterfront Suites overlooking the harbour. If you are looking for romantic getaways in Maine with spa services, the hotel offers in-room spa treatments and complimentary access to a fitness facility. Camden Harbour Inn is recognized as one of New England’s most exclusive boutique hotels, offering guests the opportunity to experience an exceptional ocean-side escape in the lap of luxury. The historic inn boasts sumptuous suites and rooms, all individually decorated to reflect the essence of luxury and to provide an oasis of serenity perfect after a busy day of exploring the Maine coast. The rooms all feature wonderful views, king-size beds with fine linens, luxury bathrooms, and many little extras to pamper you and make you feel at home. The inn also offers exceptional fine dining at Natalies’s Restaurant, regarded as being one of the best dining venues in Maine. 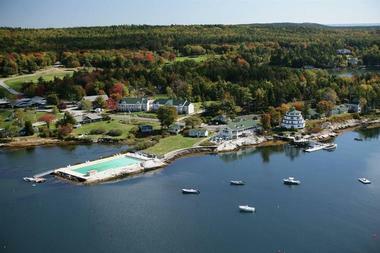 If you are looking for exceptional Maine vacations, Camden Harbour Inn is a beautiful place to visit. Keep reading for more romantic getaways near me. 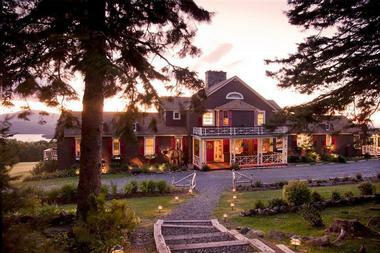 The Inn at Ocean's Edge is located on the coast of Maine. Since the inn is set on 22 scenic acres, there is plenty to explore and enjoy romantic walks along the shore overlooking Penobscot Bay. The property has a vanishing edge swimming pool, offering a perfect setting for a romantic escape. Guests have a choice of 32 guest accommodations in three separate structures: The Main Inn, the Hilltop Building and the Poolhouse. Ask for a room with a balcony, especially in the summer, so that you can sit outside and take in the healing ocean air. 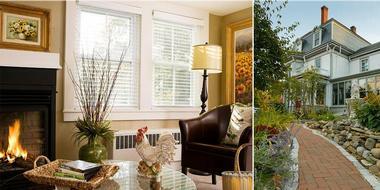 The property is 3.5 hours from Boston and 1.5 hours from Portland, making it a great weekend trip from both cities. Activities include bicycling, scenic ferry ride to Islesboro, shopping along Main Street and helicopter rides. There is a spa, exercise room, hot tub and an outdoor fireplace. There are many nearby bistros and local restaurants offering gourmet dining options. Rooms start at $209 per night. The rate includes breakfast and afternoon sweets. Ask about Maine vacation packages when booking your stay. The Colony Hotel is set in a beautiful location along the coast of Maine, perfect for those who love ocean views and great food. The property is eco-friendly and utilizes sustainable practices such as recycling, reusing and reduction of pollutants. The hotel is open every year from mid-May through late October. 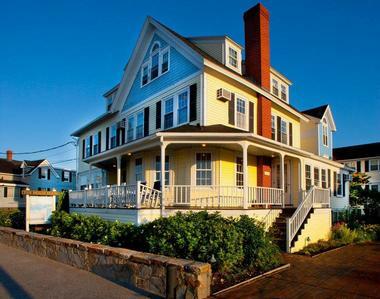 It features a heated saltwater outdoor pool, private sandy beach and delicious Maine cuisine. Activities include Maine art exhibitions, putting green, croquet, badminton, shuffleboard, bicycle rentals, bird habitat tours and scavenger hunts for families. What activities are available to the romantic couple? Nearby you will find three scenic golf courses, kayaking and canoeing tours, parasailing, sailing, fishing, boating, lobster and whale watching. There is also shopping, art galleries, museums, wildlife preserve, historic homes and other local attractions. Driving time from New York City is about 6 hours, from Boston about 1.5 hours. Bar Harbor is 3.5 hours away. Asticou Inn is located next to Acadia National Park at the northern point of Northeast Harbor and tucked away at the foot of Eliot Mountain. 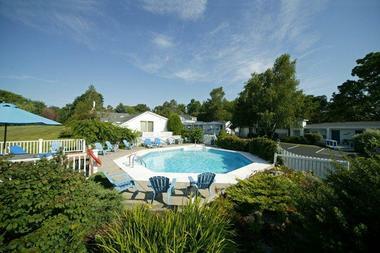 The main inn offers 31 guest rooms that have country or harbor views along with queen, king or twin bed accommodations. In addition, there are 17 other rooms spread between Blue Spruce, Bird Bank, Topsider Cottages and Cranberry Lodge, all just a walk from the main inn. Amenities include a swimming pool that’s heated, clay tennis court, free Wi-Fi, onsite dining options and concierge services. There is free parking and you are within walking distance of the Azalea and Thuya Gardens. For dining you can enjoy sublime views of the Northeast Harbor while dining on gourmet food at Peabody’s. New England food at its best, the menu boasts savory and delicate breakfast items, including salmon and poached eggs as well as filet mignon, lamb and seafood on the dinner menu. Pair with any of a number of wines for the perfect meal. 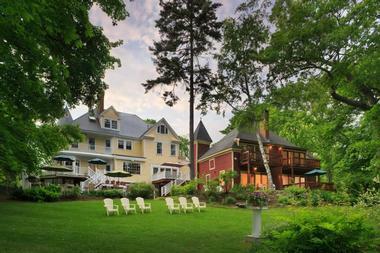 The Norumbega Inn invites visitors to spend a very special sojourn in a beautifully restored stone castle in Camden. The historic building is situated in an elevated position overlooking Penobscot Bay, and each of the eleven rooms and suites have been individually furnished and decorated to provide every modern comfort and a wonderfully relaxing ambiance reminiscent of a by-gone era. Each room has a king-size bed (several feature four-poster beds) and spacious bathroom, and all rooms have ocean, garden, or harbor views. The inn is particularly proud of their cuisine and pampers guests with three-course breakfasts and sensational fine dining dinners. Set in the heart of Belfast, Maine, this luxurious boutique hotel is the perfect base from which to explore the area, or to simply luxuriate in the sophisticated splendor of the establishment’s surroundings. Exuding elegance and grace fit for the most discerning traveler, The Belfast Bay Inn is an opulent oasis of understated charm where guests are graciously welcomed and made to feel at home. Eight exquisitely appointed double rooms and king suites are air-conditioned and enjoy rich and refined furnishings, deluxe amenities and spacious en-suite bathrooms. Certain suites have gas fireplaces, private balconies and beautiful harbor views, while all guests are treated to breakfast in bed each morning. Stroll through the lush, landscaped gardens, indulge your senses with a pampering massage in the comfort of your room, or take in one of the many museums and art galleries in the nearby town of Belfast. Sample culinary delights from an array of excellent restaurants in the area and enjoy the finest wine from well-stocked cellars. Rates start at $178 per night. Located in a picturesque seaside village in central Maine, Hartstone Inn is a getaway for foodies. Grab one of the famous gourmet lobster roll picnic baskets and head out to sea or hike along a scenic trail. There are 21 elegant guest rooms and suites in two separate buildings. Decor includes original artwork, lace canopy beds and fireplaces. Ask for a room with a jacuzzi tub for extra relaxation on your weekend break. In the evening, the restaurant serves a gourmet dinner featuring New England dishes with an international flair. Rooms start at $160 per night. Keep reading for more romantic getaways near me. 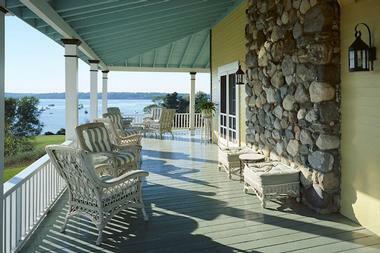 Maine Stay Inn & Cottages in Camden offers the romance of yesteryear and comfort and amenities of today. This lovely historic building, built by Alden Bass in 1802, when Thomas Jefferson was the President, is a delightful reminder of more relaxed and more elegant times. It is surrounded by an acre of beautiful, lush gardens you can explore through winding narrow paths across a cool brook with an old granite bridge, or you can rest on one of many benches and watch the wild animals visiting from the neighboring state park. All rooms are incredibly romantic with antique beds, period furnishings, colorful wallpapers, and original paintings. Meet your fellow guests in the charming old-fashioned parlor by the fireplace, or venture out and explore the surrounding historic district of Camden. Camden is a lovely place to visit any time of the year. It has a charming historic district, exciting nature trails, superb restaurants, incredibly fresh seafood, an abundance of local produce, fantastic arts community, and numerous festivals. Make the Hawthorn Inn your base when you come to Camden, and enjoy a rare combination of old-fashioned charm and modern amenities. 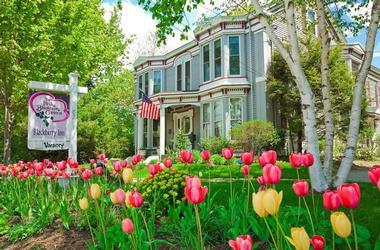 It is situated in an elegant, Queen Anne Victorian mansion, surrounded by more than an acre of beautiful gardens and perfectly manicured lawns. 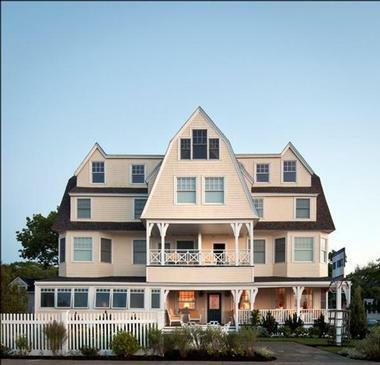 You can stay in the Carriage House, with four large, romantic rooms with two-person Jacuzzi tubs, lovely views of the harbor and gardens, fireplaces, and private decks. Staying in the main house is no less romantic – all rooms have their own character and are beautifully decorated, very comfortable and have private baths. The Inn is famous for its two-course gourmet breakfasts that are served on the terrace when weather permits. Glen Cove Inn & Suites is a perfect balance between a quaint bed and breakfast and a large, impersonal hotel. Its 36 comfortable modern rooms and two large suites offer all comforts and amenities of a hotel, but have just the right amount of Maine romance and nautical touches in décor to be charming and welcoming. The inn is perfect for a romantic getaway, or as a base for exploring the Maine coast. If you are traveling with your four-legged friend, choose one of the two suites that are pet-friendly. All rooms are air-conditioned and have private baths. Few have fantastic view of Penobscot Bay and some have a private deck. The inn serves superb gourmet breakfast with fresh baked goodies. During the summer, you can enjoy a small but charming swimming pool. Birchwood Sustainable Lodging and its quaint red barn are located just across from Penobscot Bay, about half way between Camden and Lincolnville. It is part of the beautiful small farm full of fruit trees, vegetable gardens and free-roaming chickens. The guest rooms, cottage and apartment are simply decorated but extremely comfortable. Spectacular views of the ocean from the sweeping deck more than make up for the lack of fancy amenities. Rooms have private baths, wood floors and Maine-made cottage-style furniture. The simple light breakfast offers baked goods made with fruit and eggs raised on site. The lodge is solar-powered and makes a big effort to minimize impact on the surrounding environment through composting, recycling, green housekeeping and organic gardening. Birchwood is a certified environmental leader in lodging. The historic Beach House Inn feels like staying in a private beach house with scenic views of Kennebunk Beach in Kennebunkport, Maine. Guest rooms and suites are furnished with antiques and luxurious fabrics. The Junior Suite is ideal for couples who would like more space and a whirlpool tub. Rooms start at $139 per night. Guests receive a complimentary country continental breakfast, traditional afternoon tea, and a cheese platter, port and brandy in the evening. If you are wondering what to do on your trip, the innkeepers can recommend the best tours, scenic walks and shops in town. The Cliff House Resort is an oceanfront getaway with an outdoor labyrinth and a full service wellness center. 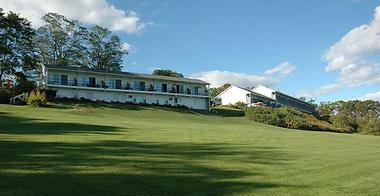 The resort is set on 70 acres in southern Maine. It opens in April for the summer season. There are 10 treatment rooms, a state-of-the-art fitness center, an outdoor stone labyrinth, adult-only lap pool and an outdoor pool with a vanishing edge. Rates start at $180 per night. Rooms have windows and decks overlooking the ocean. Perched on the edge of Goose Rocks Beach, Tides Beach Club is the ideal spot to spend a summer vacation enjoying one of Maine’s most beautiful beaches. The inn is light, bright, and breezy, and each of the 21 rooms and suites have been individually decorated in a contemporary coastal style to provide the perfect retreat after a busy day on the beach. The rooms have either king or queen-size beds, superior linens, flat-screen TV’s, Wi-Fi, and lovely marble bathrooms. Beach recliners and towels are supplied, and there are a wide variety of water sports available, including paddle-boards and kayaks. The Lord Camden Inn is a downtown boutique-style hotel in the heart of Camden Village just steps away from great shopping, dining, and the waterfront boardwalk. The inn has 36 beautifully appointed rooms and suites, many of which have views of Camden Harbor. The rooms have been carefully decorated to incorporate some of the old-world brickwork into the modern architectural design, which includes marble and granite features. Some of the rooms have microwaves and small refrigerators, Keurig coffee makers, and other luxury appointments. Fine linens and toiletries complete the pampering. The inn also has a fitness room and serves a generous buffet breakfast. Island View Inn is situated on nine acres of land on a slightly elevated ledge overlooking beautiful Penobscot Bay in Rockport, Maine. The hotel offers a variety of comfortable and affordable accommodation to suit all budgets. Most of the 41 rooms have great ocean views, and several have private balconies. The rooms all have king or queen-size beds, flat panel TV’s with cable channels, air-conditioning, Wi-Fi, and spacious bathrooms with a shower/tub combination. There is a heated outdoor pool and direct access to the beach, where you can enjoy swimming in the ocean, sunbathing, or exploring the beautiful coastline. Scenically nestled amid 23 manicured acres above a beautiful tidal cove in Penobscot Bay, the Island View Inn provides the ideal setting for an ocean-side holiday. The inn is just a short drive from picturesque Camden Harbor and is right in the heart of the USA’s Lobster Capital, Rockport. Aside from the beaches and great views, the area offers several museums and many annual festivals. All the rooms at Island View Inn have private balconies with sea views, king-size beds, spacious bathrooms, and every modern convenience you may require, including binoculars! There is an outdoor heated pool with majestic views and direct beach access. 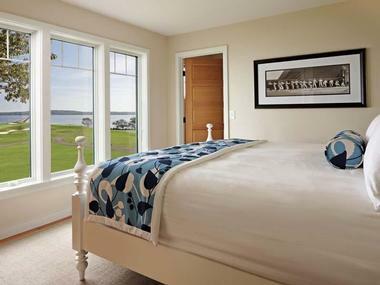 Chebeague Island Inn offers stunning views of Casco Bay and the Great Chebeague Golf Club. This historic getaway dates back to the 1880s and is just 1.5 hours north of Boston or Portland, a perfect idea if you want to slip away for a quiet weekend year-round. If you are arriving in your own boat, there are eight private moorings and complimentary launch service. Guests are accommodated in 21 guest rooms furnished with locally made furniture and art. Chebeague island offers beautiful beaches, shops and restaurants. The restaurant, open for lunch and dinner, has floor-to-ceiling windows with great views. Have a romantic dinner to celebrate a special occasion, anniversary or even pop the question. Rooms start at $315 per night. The The Inns at Blackberry Common is a luxury bed and breakfast in a charming traditional New England house situated in a beautiful garden setting just a short stroll from Camden Harbor. The Inns have a selection of rooms, each of which have been individually furnished and decorated to provide a restful ambiance. All rooms have either king or queen-size beds, (many feature antique four-poster beds), charming bathrooms with antique tubs, whirlpool baths or bath/shower combinations, and either bay or garden views. Sumptuous breakfasts feature fresh local produce with herbs and berries from the gardens. The location is perfect for exploring Midcoast Maine. Located on the picturesque east coast of Mount Desert Island off the coast of Maine, Bar Harbor has been a favorite island holiday destination since the early 19th century. The natural beauty of the island has been attracting artists for decades, and many celebrities have built palatial holiday homes along the shoreline. At the Hulls Cove Visitor Center you can watch a short orientation video and get maps for exploring the Acadia National Park which now protects most of the island and provides a range of activities including hiking, mountain biking, climbing, horse-back riding and bird watching. Most visitors come to enjoy the fabulous walks and hiking paths - Shore Path and Ocean Trail are two of the best, boasting wonderful coastal views and a peak at some of the holiday mansions, and the Village Green, Agamont Park or the College of the Atlantic Gardens is great for a gentle stroll. You can hop aboard an Oli's Trolley Tour or find your way around using the Free Island Explorer Shuttle. Off shore activities include whale watching tours with Bar Harbor Whale Watch Company, lobster fishing trips on the Miss Samantha or a guided kayaking tour with National Park Sea Kayak Tours. Other island activities include Acadia Photo Safaris, Acadia Air Tours and climbing lessons at the Acadia Mountain Guides Climbing School. 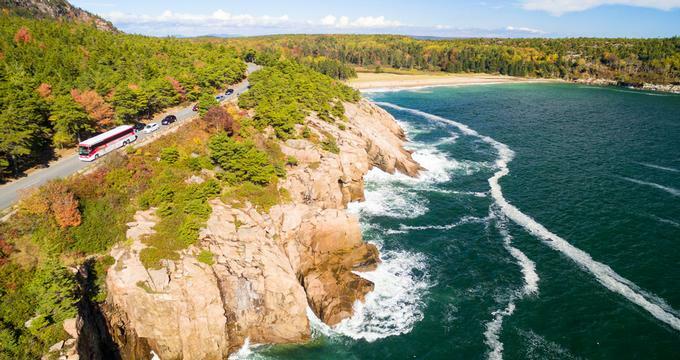 Camden is a picture-perfect sea-side resort tucked between Mount Battie and Penobscot Bay, providing an ideal coastal holiday destination. Camden has a rich maritime history and one of the best ways to see the superb Maine coastline is on a 2 hour scenic cruise on a vintage schooner - you can choose between the Schooner Surprise, which is a racing ship built in 1918, or try Schooner Olad, a historic sailing ship built in 1927. If you enjoy water sports you can go on a guided canoe, kayak or fishing excursion with local expert Mike Kinney, and for a unique aerial perspective of the coastline you can choose an exciting glider ride with Spirit Soaring Glider Rides. If you prefer to keep you feet firmly on the ground there are many interesting walking and hiking trails in the Mount Battie and Camden Hills State Park, where you can enjoy great views and scenic picnic spots. During a summer visit you can spend some time soaking up the sun and swimming at Barrett's Cove Beach on Megunicook Lake, and in winter you can have many hours of fun in Camden Snow Bowl where you can go skiing, snow-boarding, tobogganing and snow-shoeing on five miles of trails and 20 ski runs. A good way to round off a busy day is to watch an opera, concert or musical at the Camden Opera House. Portland is situated on a picturesque peninsula which extends into Casco Bay off the coast of Maine, providing the ideal weekend coastal getaway. Quaint, cobblestoned Commercial Street, which runs along the water's edge and is lined with vintage architecture and interesting shops and restaurants, should be your first stop. Here you can enjoy fabulous New England seafood while you watch the passing parade of boats. You can explore the beautiful coastline on a Summer Feet Cycling Adventure - their Five Lighthouse Bicycle Tour is the most popular choice, or visit some of the islands in Casco Bay on a tour with Casco Bay Lines. Portland Discovery Land and Sea Tours also offer boat tours or vintage trolley tours around downtown Portland. Wildlife enthusiasts can get up close to enormous whales with Odyssey Whale Watch - you will be taken about 20 miles offshore to see whales, dolphins, sharks and seabirds. 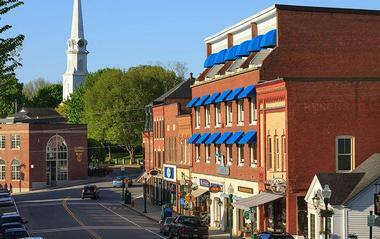 You can learn about the history of Portland on a visit to the Maine Historic Society and the Wadsworth Longfellow House in the downtown Portland Arts District, which is the oldest standing structure in Maine. Other attractions include the Portland Museum of Art, the Portland Symphony Orchestra at Merrill Auditorium, the fascinating International Cryptozoology Museum and the Maine Narrow Gauge Railroad Company and Museum, where you can treat the kids to an Ice Cream Train Ride. The charming city of Bangor is situated on the banks of the Penobscot River in the Maine Highlands, and provides a playground for all adventure seekers. The city has a rich historic legacy dating back to its heyday as a lumber center in the 1860's and today you can explore many beautiful 19th century homes in the West Market Square Historic District and in Broadway Historic District, which is nowadays home to the famous horror novelist Stephen King. (Fans can go on a Tommyknockers and More Tour to see some of the actual city locations featured in some of his books). You can go walking, hiking or biking in the Bangor City Forest, visit one of several wildlife refuges to do some bird watching, or go canoeing or kayaking (rentals are available) in summer or snowmobiling, cross-country skiing or snow-shoeing in winter. There are also plenty of cultural activities to enjoy - the UMaine Museum of Art and the Robert E. White Gallery on the Husson University campus will captivate art lovers and music enthusiasts can attend the Bangor Symphony Orchestra or watch a musical at the historic Bangor Opera House. Families can have hours of educational fun at the Maine Discovery Museum and learn about the history of the city at the Maine Forest and Logging Museum which includes a realistic reconstruction of a 19th century logging community. Kennebunkport is a popular year-round getaway destination that has been pleasing visitors for generations with great beaches, good boating and wonderful Southern Maine cuisine. In summer the beaches are the greatest draw-card - you can soak up the sun, swim and build sand-castles on Colony Beach or go walking on Goose Rocks Beach, which is also a good spot for fishing. If you enjoy historic architecture you can take a stroll down Summer Street to admire several sea captains mansions and then visit White Columns, formerly known as Nott House, where the Kennebunkport Historical Society displays memorabilia of President George W. Bush's family, who have a summer house at Walker's Point in Kennebunkport. Besides the beaches, boating is the most popular activity and you can choose from a variety of excursions including whale watching tours, fishing trips or scenic sailing cruises on the Pineapple Ketch or the Schooner Eleanor. There are several rental outlets where you can rent canoes, kayaks, bicycles and scooters to explore the beautiful coastline. When you have your fill of sea and sun for the day you can stroll around Dock Square in the heart of the town to visit quaint boutiques and craft shops, tour the Shipyard Ale Brewery, or enjoy a New England seafood feast at one of the many restaurants. The town hosts several annual festivals and events including fun Zombie Walks and Haunted House Tours around Halloween. Rockland is the quintessential Maine coastal holiday town, providing a wonderful New England atmosphere, great boating and fresh Maine lobster, combined with historic and cultural activities. A good place to start your visit is at the Maine Discovery Center Visitor's Center in downtown Rockland, where you can pick up maps and attraction information. While you are there you can visit the Maine Lighthouse Museum, and to see a real historic lighthouse (and get some exercise) you can navigate the rocky breakwater jutting into Rockland Harbor to visit Rockland Breakwater Light, which has been in operation since 1902. You can take a stroll through downtown Rockland to see many examples of historic architecture (history buffs might like to go on a guided Historic and Cultural Tour of the town). Art lovers can spend some time at the Farnsworth Art Museum, the Wyeth Center and the Center for Maine Contemporary Art. Many visitors come to Rockland primarily to enjoy seafood and sailing (the town is renowned as both the lobster and windjammer capital of the U.S.A.) - outfitters such as American Eagle, Heritage or Timberwind can take you along the coastline on a historic windjammer, or you can visit some of the off-shore islands by ferry with the Maine State Ferry Service. Kayak enthusiasts can try a sea kayaking excursion with Breakwater Kayak Co. LLC. Ogunquit is proudly home to one of the best sandy beaches in Maine and is the ideal spot to spend a relaxing coastal holiday. You can access the 3.5 mile Main Beach from Beach Street in the center of town, rent your umbrella and beach chair and settle in to soak up the sun. If you prefer a quieter beach you can try Footbridge Beach, accessed via a short hike along the footbridge over the Ogunquit River. Besides relaxing on the beach there are a variety of other coastal attractions including whale watching (First Chance Whale Watch), sailing cruises on the Schooner Eleanor, deep-sea fishing excursions (Ugly Anne or Bunny Clark Deep Sea Fishing) or a Perkins Cove Lobster Tour. Walkers and hikers can explore The Marginal Way, a paved trail running along the rocky edge of the shore, or the Rachel Carson National Wildlife Refuge in nearby Wells. Ogunquit also has several interesting museums starting with the Ogunquit Heritage Museum which is housed in the circa1780 Captain James Winn House and is full of nautical memorabilia. At the Ogunquit Fire Company Fire Museum you can see a vintage fire engine, and if you care to drive a short distance you can see more than 70 vintage motor vehicles at the Wells Auto Museum. Art lovers will enjoy the Chuckle Button Farm Gallery and the Ogunquit Museum of American Art. Bethel is nestled in Maine's Western Lakes and Mountains region just 90 minutes from Portland, and has long been a favorite year-round getaway destination. In summer the town attracts many hikers who come to enjoy Grafton Notch State Park, which includes 12 of the most strenuous miles of the famous Appalachian Trail. Here you can take on some strenuous backcountry trails which will reward you will wonderful summit views or amble along some of the short trails to inviting waterfalls and gorges. If you visit during fall the foliage is a brilliant bonus, while winter visitors can enjoy cross-country skiing, snowmobiling and snow-shoeing in the park. Water sport enthusiasts can go on a guided kayaking excursion with Bethel Outdoor Adventures, and if cycling is more to your liking you can hire all the gear you need to explore by bike from Bethel Bicycles LLC. Bethel is just five miles from the famous Sunday River Ski Area where you can enjoy an exhilarating ski experience in winter and scenic lift rides, zip line tours, rock-climbing, swimming, kayaking, white-water rafting, and mountain-biking in summer. For a change of pacy you can visit the Maine Mineral and Gem Museum, a Bethel Historical Society Exhibition, Elements Art Gallery or the Maine Ski Museum. If you long to escape to a quiet and serene coastal destination you should be planning a getaway to Lubec, the eastern-most spot on the vast Maine coastline. You can be the first to see the sunrise as you walk along deserted beaches and trails and get back to nature amid fragrant pine forests. You can take your pick from a selection hiking trails including strenuous cliff-top trails and gentle walks. Besides hiking you can admire the superb scenery on two wheels by hiring a bicycle and setting off to explore the many cycling trails. Boating is also very popular and there are no fewer than five historic lighthouses you can visit on a whale watching and sightseeing excursion from one of several operators. There are a number of self-guided walking tours that will introduce you to the history of Lubec - you can download the narrated tours to your phone and then explore at your own pace. You can also visit the Lubec Historical Society and Museum on Main Street, the McCurdy Smokehouse Museum and the Robert S. Peacock Fire Museum. The natural beauty of the area has attracted many artists and you can view their work at several galleries dotted around the town, including the Crow Town Gallery and the Friar's Bay Studio and Gallery. Situated in the foothills of the White Mountains north of Portland, Sebago Lake State Park is a perfect year-round getaway destination for the whole family. Sebago Lake is one of the largest lakes in Maine and provides near-ideal conditions for a wide variety of water sports including some of the best fishing in the state. You can explore literally dozens of inlets and coves by boat (motorized boating is allowed) or on a leisurely canoe or kayak excursion - if you don't have your own equipment you can hire from Sebago Trails Paddling Company. There are many sandy beaches for soaking up the summer sunshine and shaded forested areas for hiking, walking and bird watching. There are also good trails for cycling and playgrounds for the children. The best way to get back to nature in the Sebago Lake State Park is to bring along your tent or RV and spend a few nights camping in the Sebago Lake Campground which has 250 serviced camp sites. If you visit the park during winter you will find it transformed into a snow-covered wonderland where you can explore five and a half miles of groomed trails and six miles of un-groomed trails on cross-country skis or snow shoes and try your hand at winter fishing. Maine’s Cape Elizabeth, close to the entrance to Portland Harbor, is known among seamen for being a dangerous and treacherous spot. At least ninety-eight ships have sunk on the shores of Cape Elizabeth from 1780 to 1990. After the American Revolution, Portland Harbor was considered an important port, and to insure its safety a lighthouse was built in 1828 withtwo 50-foot towers made of rubble stone. They were300 yards apart, octagonal in shape, black on the top, and bright white on the bottom. The facility was named Two Lights or Cape Elizabeth Light. In 1874, the stone towers were replaced by cast iron conical towers 67 feet high and 129 feet above sea level. In 1924, the western light was turned off and later sold in 1971. The eastern tower is still in service under the name Cape Elizabeth Light. The lighthouse is located next to 41-acre Two Lights State Park, which offers nice views and access to the lighthouse.